Combine the above ingredients with water to make a thick paste. Marinate the fish pieces using this paste. Keep this for 1/2 to 1 hour. Fry them in oil. 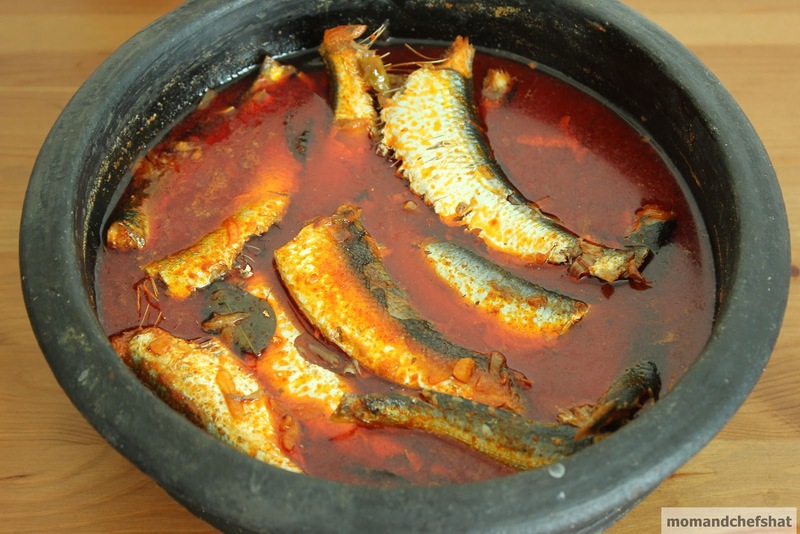 Marinate fish with lemon juice, red chilli powder, ginger paste, and garlic paste. Keep this for 20-25 minutes. Make a paste by mixing vinegar, besan, carom seeds, egg, yogurt, and rice flour. Dip the marinated fish pieces in this paste and coat it well with the paste. Deep fry till golden brown. 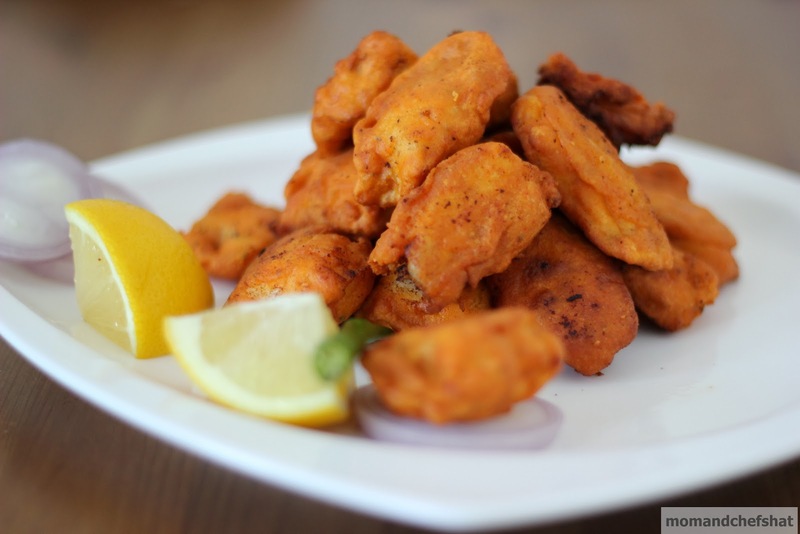 Serve fish fry with a sprinkling of chaat masala, good squeeze of lemon, onion rings, and coriander leaves. Clean and wash the sardines. Cut it into 3 pieces if they are big, and 2 if they are small. Heat 1 tsp coconut oil in a pan. Roast grated coconut. When it turns brown in color, switch off the stove, add coriander powder, chilly powder, turmeric powder, pepper powder and fenugreek seeds. Mix well. Let it cool. Once cooled, grind it to a fine paste in a mixer. Keep this paste aside. Heat oil in a pan. 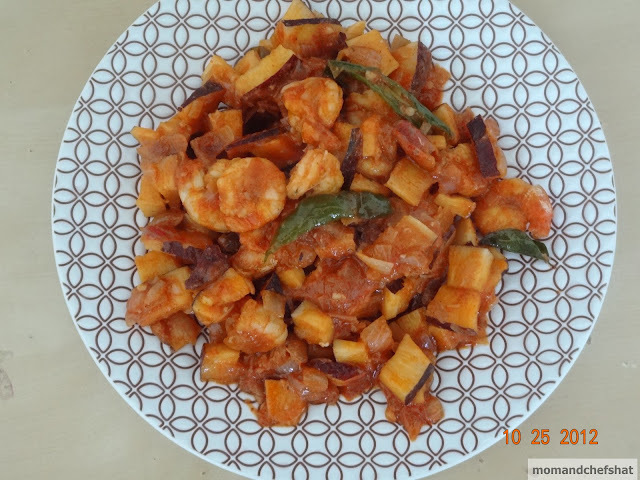 Saute ginger and curry leaves. Now add onion and saute it. Once it is sauteed, add green chillies. When onion starts to turn brown, add the ground paste along with 1/4 cup of water. Saute them. When it starts to boil, lower the heat, add fish, kodumpuli along with the soaked water, desired amounts of water and salt. Close the lid and cook till the fish is done. 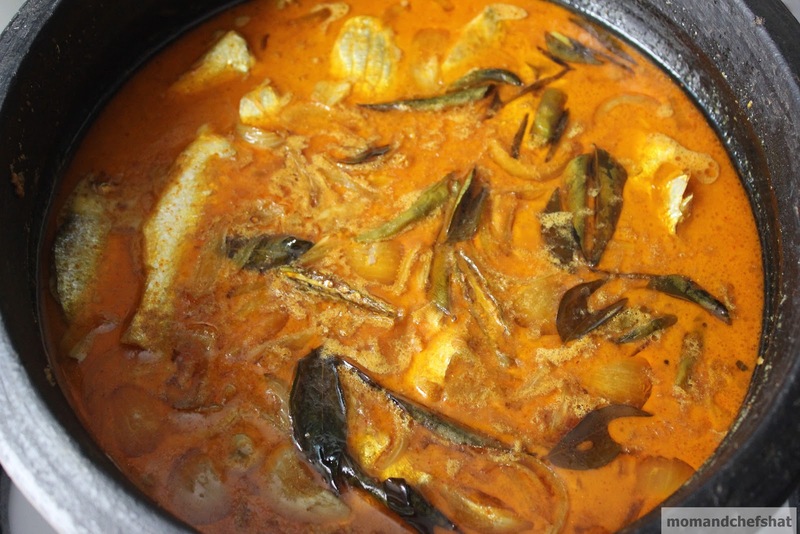 When oil starts to appear on the surface, it is a sign that curry is ready to be served. Note:- Adjust the amount of water during the cooking process depending on how thick you want your gravy. Have you heard of harrowing escapades? If only prawns knew it is no more a bait fish rather a privileged seafood. 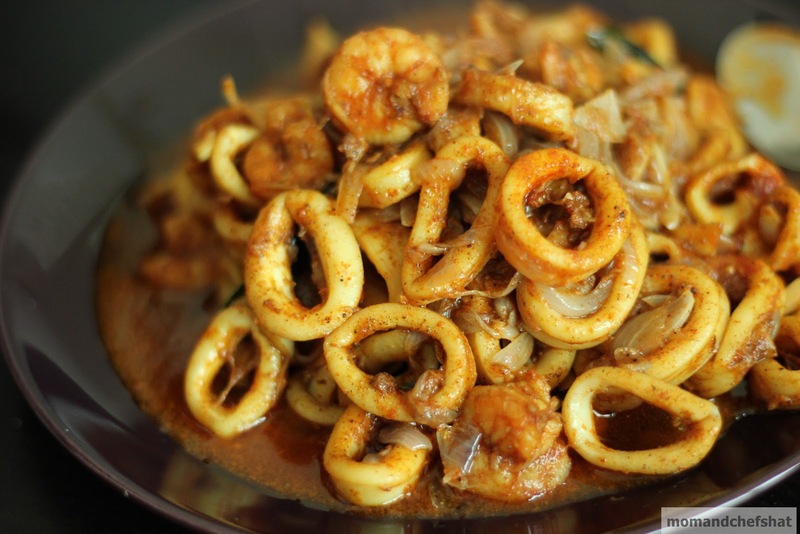 Even though squid prawn roast is a lot about squid, the controversial topic running in my family is all about prawns. It is in rarity that prawns reach my stovetop to be converted to a soul feeding prawn stock-locked pure bliss - prawn curry. It is not that we don't buy it. It is carted home more than few times in winter months straight to the refrigerator box by fisherman of the house, where it will be fighting with my frozen veggies to find a respectable place, often that ends in a tight squeeze. I feel so excited and starts dreaming about the innumerable ways it can be cooked, photographed, blogged, and then making a sensation in my small space. Before I know it, we are packing our bags for fishing trip, and even before my mind and brain come to consensus, prawns will be hanging as a bait in my hubby's fishing rod. Whew! Now I am free from the mind boggling situation of chopping, stirring, and cooking a curry - I tell myself as part of making harmony with the situation. 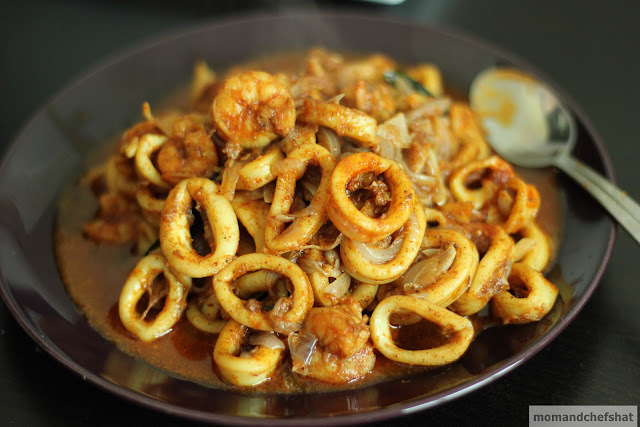 As winter give way to blistering summer and fishing not a top priority for him anymore, he parted with his prawns and squids. 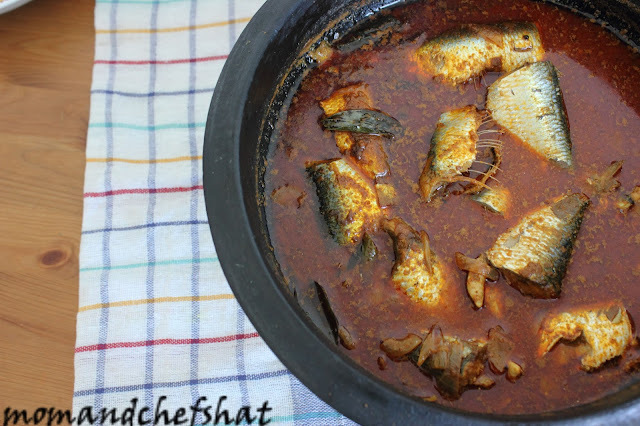 So isn't it all about escape from his bait to my munchatti (earthern bowl used in Kerala style cooking). I suggest you to combine prawns and squids especially if you are running out of prawns with increased number of squids on your hands. Not only is it a thrifty way of doing things, but you will be amazed by how little prawns can flavor the squid in an elegant way. 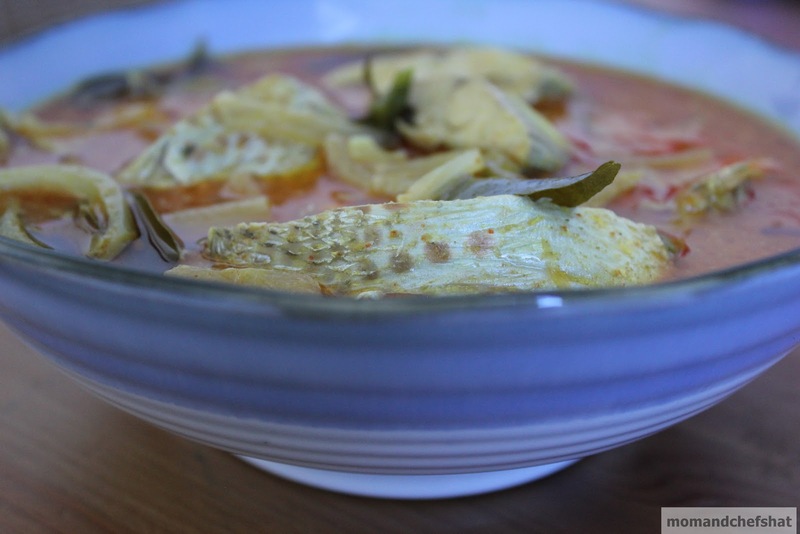 Oh and the stock if any remaining, splattered on the plate (as seen above) is well worth a rinse with some boiled rice, going straight to your mouth, then again the ultimate lick. Disclaimer:- I totally respect other people's hobbies and likes and in no way want to hurt anybody living near or distant. In a pressure cooker, cook squid, prawns, green chillies, turmeric powder, curry leaves and salt along with 2 tbsp of water till 1 whistle. Heat oil in a kadai, saute sliced onions along with ginger and garlic. 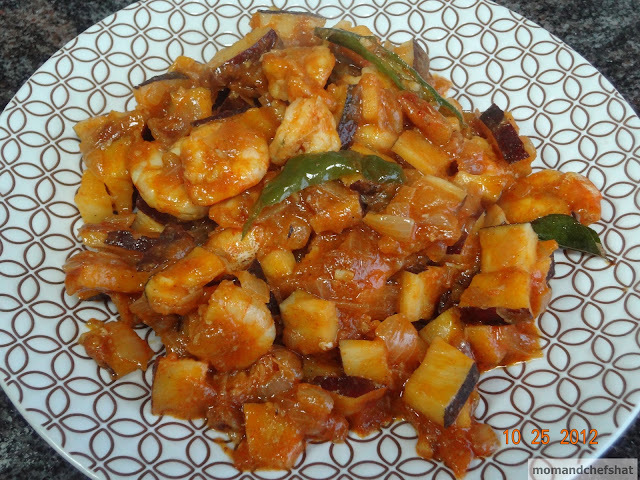 Once it is sauteed well, add chilli powder, pepper powder, and meat masala. Fry for a minute. Now add the pressure cooked ingredients. In medium heat, allow the gravy to thicken or to reach your desired consistency. 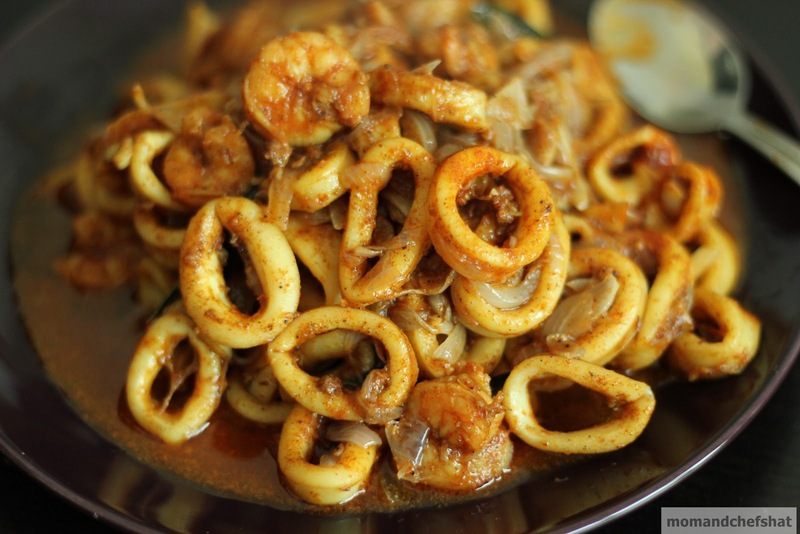 Squid prawn roast is good to go with rice. Enjoy! Oooh! how we love sardines. 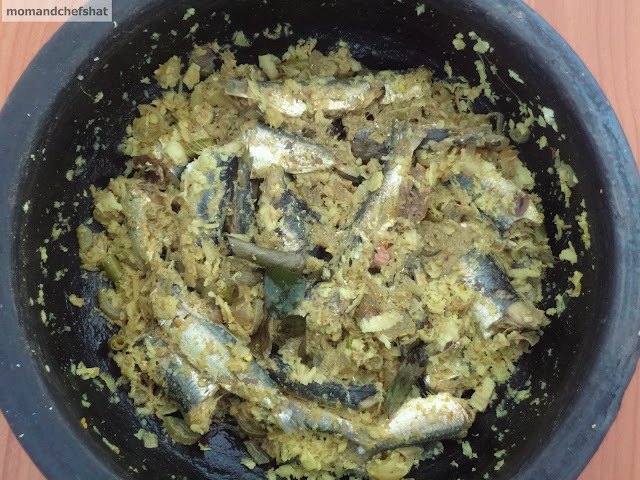 One month back, we were abstaining from meat, and my hubs reported he had this strange bouts wherein his nose sniffed involuntarily for the awesome taste of fishy fishy sardines. Hearing this do you think the sardine lover in me could drift to alpha level and retreat. No! soon we rushed to the fish market and the inexpensive fresh sardines were gleaming all silver at us. Undoubtedly, they traveled home with us sheltered in my fisherman's icebox. I feel sorry for sardines seeing how underrated they are nowadays even when the world is running for all expensive omega 3s and vitamin Ds. This is for all the sardine lovers/chala lovers hanging around www who are not ashamed of eating it, can stand the smell of sardines, and even sweat it out ........... Enjoy your meal and always eat in moderation. Heat oil in a munchatti. Saute pearl onions, green chillies, ginger, garlic, and curry leaves. When onions turn light pink in color, add kashmiri chilli powder and turmeric powder. 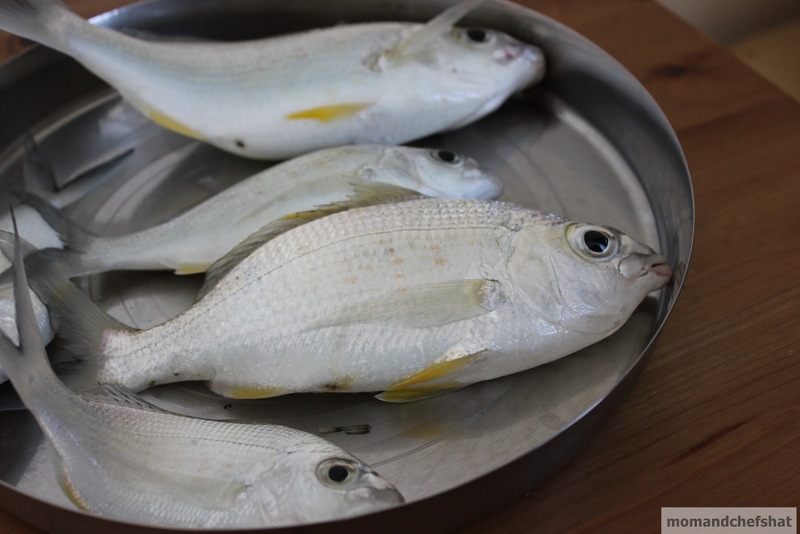 When the raw smell leaves, add water, vinegar, salt, and fish. Close the lid and cook for 5 mins or until the fish is cooked. 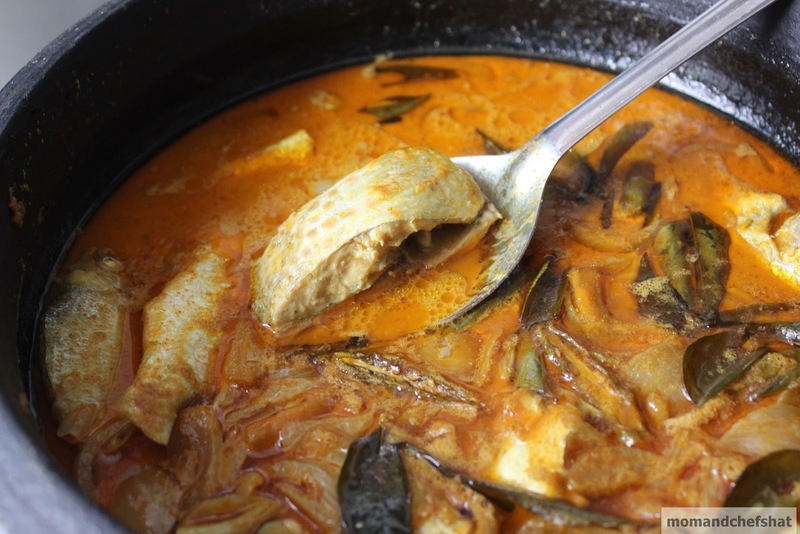 This is an addictive curry best eaten with rice, tapioca, etc. 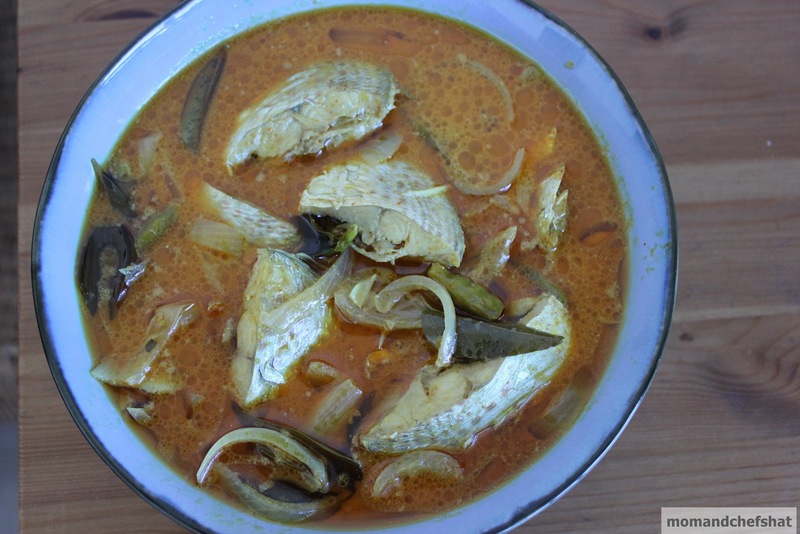 Lastly, don't forget to check on my popular meen paalu curry. I have always heard Keralites say a plate of rice and a fish fry is enough to satisfy rumbling tummies - if you can stretch yourself more - a Moru kachiyathu/moru curry ...... and how many thumbs up for this menu. Yeah, I can see ....a lot. 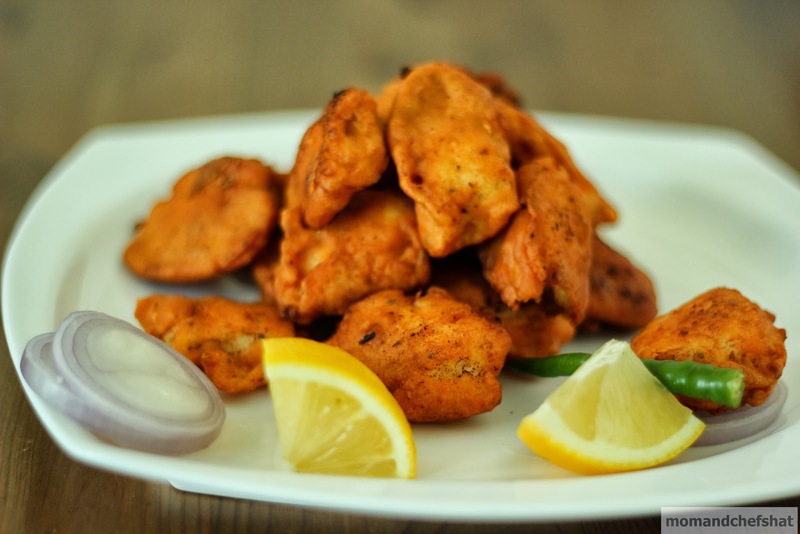 I believe fish fry is out of fashion as health freaks in us love to indulge in fish parcels and the types. 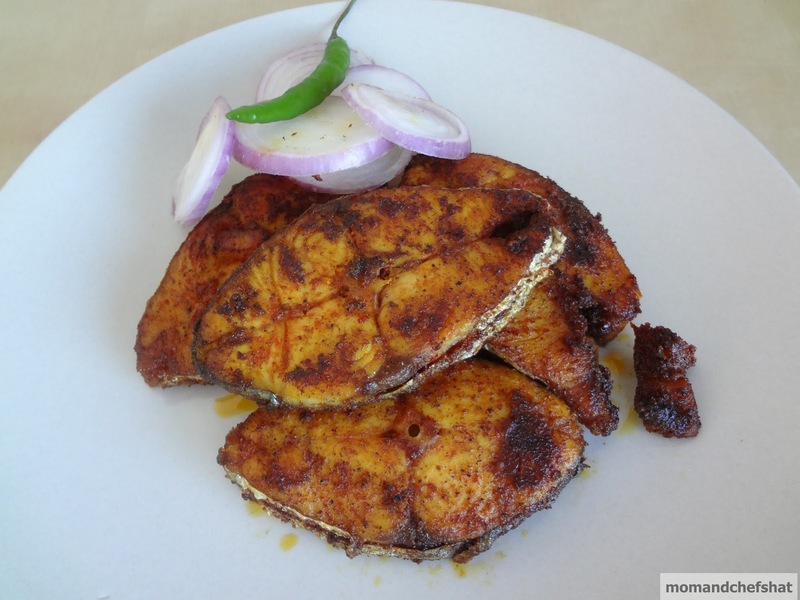 Now back to my roots with glamorous meen varuthathu/fish fry after house smelling all meat. Grind red chilli powder, turmeric powder, peppercorns, ginger, garlic, vinegar/lemon juice to a fine paste. 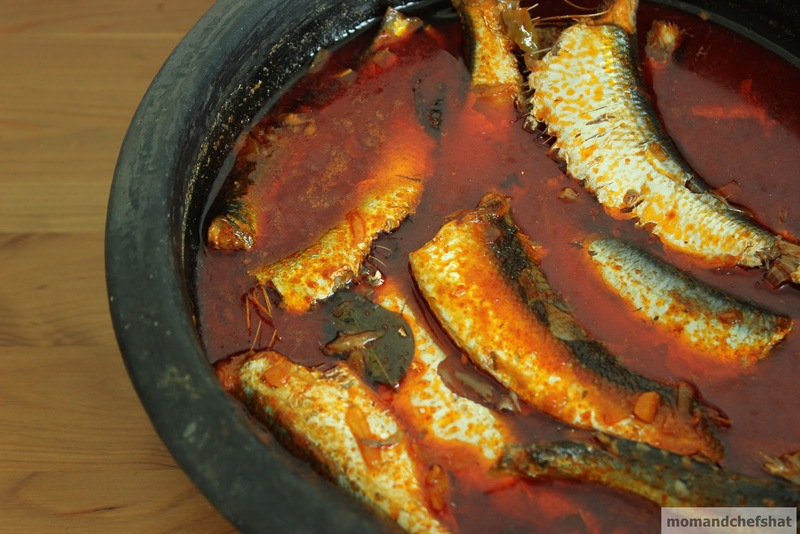 Marinate the fish pieces with the fine paste. 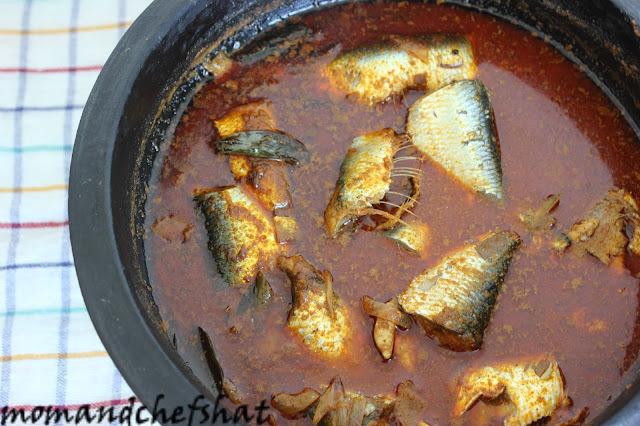 Fry fish pieces in coconut oil and transfer to a kitchen towel. Serve with raw onion rings squeezed with lemon juice. Clean the prawns. Heat oil in a pan, saute onions. Add ginger, garlic, green chillies, curry leaves. 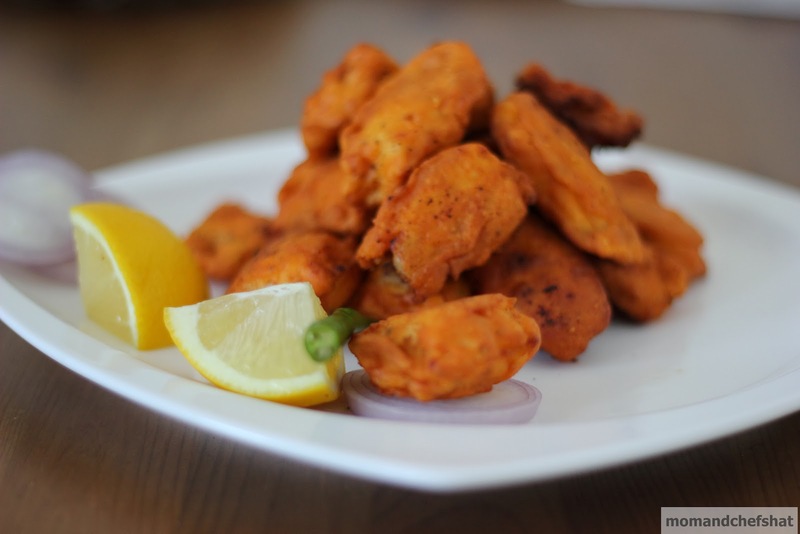 When the onion turns light brown in color, add chilli powder, turmeric powder, pepper powder, garam masala powder. Saute them for a minute. Add tomato. When the tomatoes are all mushy and oil starts to float, add coconut cuts, prawns, salt, and 1/4 cup of water. When it starts to boil, lower the flame, close the lid. Stir occasionally. Reduce the water. Switch off the stove and serve hot with rice. 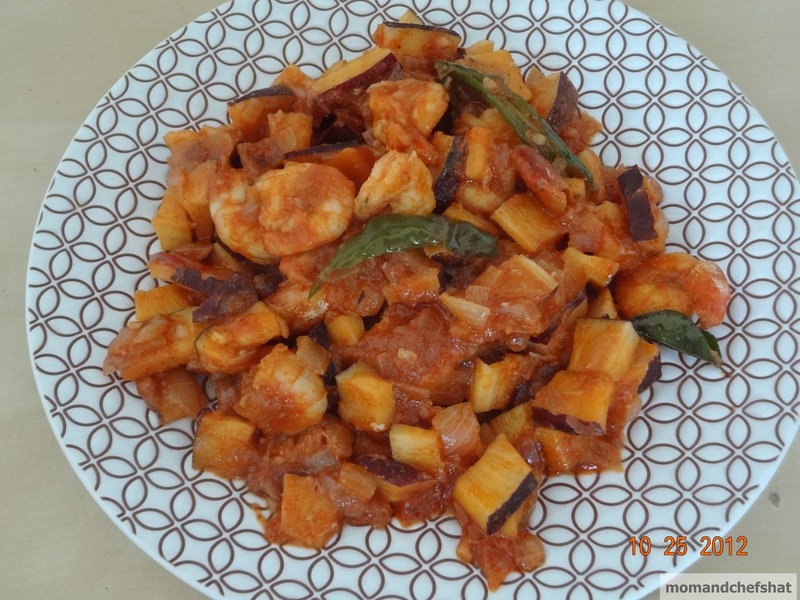 Care should be taken not to overcook the prawns. UAE is all drenched and dressed up for its 41st National Day. Long live UAE. December always bring me surprises in some form or another. This year was no different. To me it often paves a tone for the New Year to come. Thank you God all the more. I love every bit of December right from decorations, presents, carols to everything mulled. Hope December is going to be action packed. After all who can say no to festive feasts and stagnate. Clean the fish and cut them into small cubes. 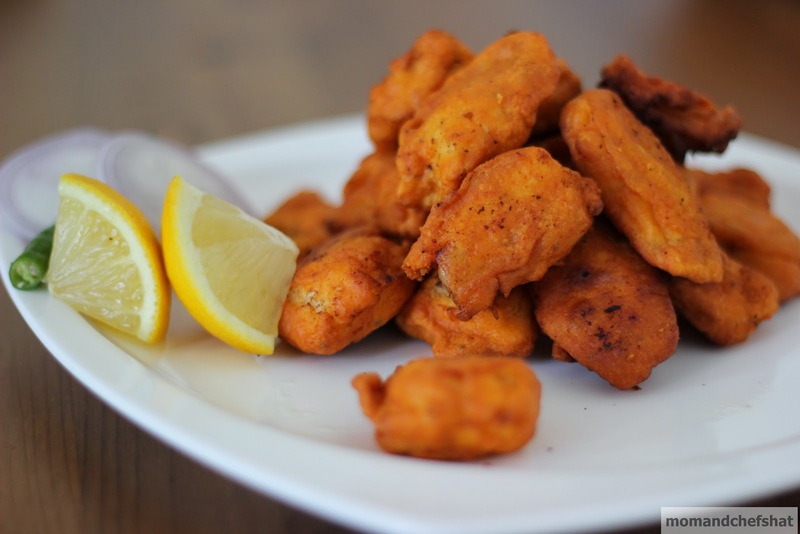 Cook fish cubes in little water along with turmeric powder and salt. Allow water to dry out completely, then mash the fish cubes. Boil the potatoes and mash them. Keep them aside. Heat oil in a pan, saute onion, green chillies, ginger, and garlic. When the onion turns translucent and the raw taste leaves, add pepper powder, chilli powder, turmeric powder, and garam masala. Saute them for 1 minute. Now add mashed fish. 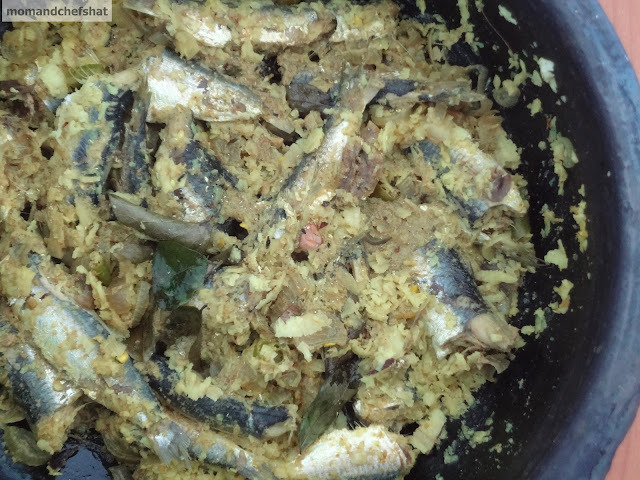 Mix them well so that the masalas coat the fish nicely. Check for salt and if required add salt. Now switch off the stove. Add mashed potatoes, coriander and mint leaves to this and mix well. Keep them aside. Now make lemon sized balls out of this and form desired shapes with your hands. Dip them in egg whites (properly coat the egg whites on all sides or else the result will be cracked cutlets). 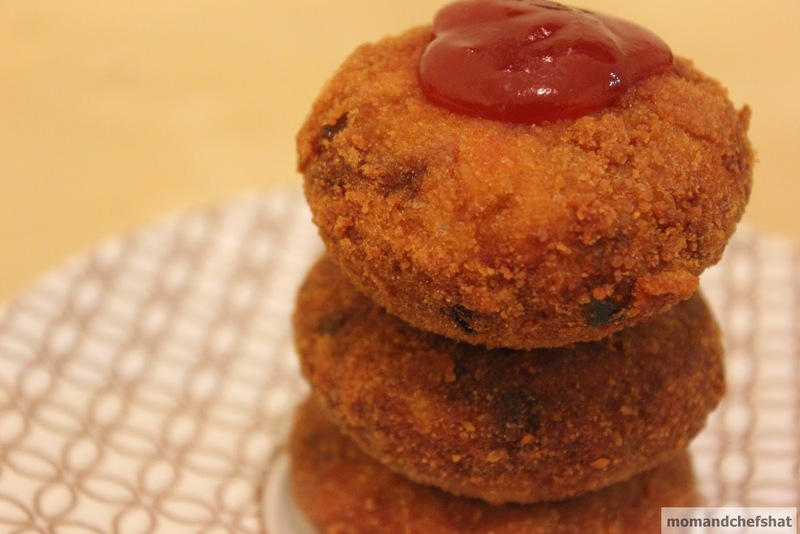 Now dip them in bread crumbs. 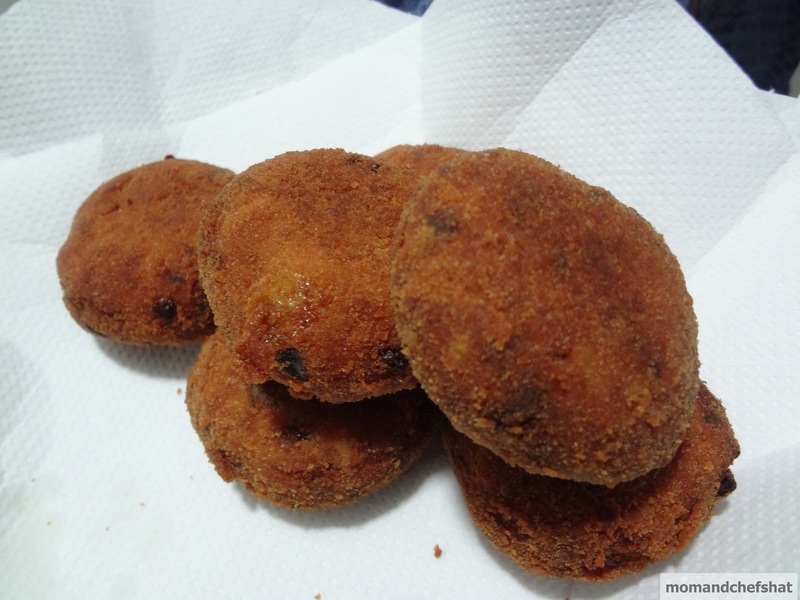 Deep fry them in oil to get a dark golden brown color as shown in the picture. 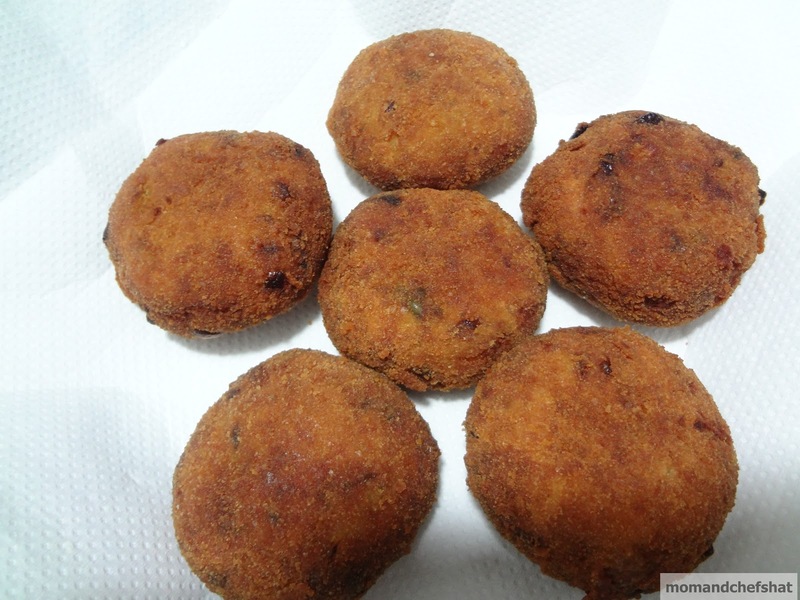 Serve cutlets with tomato ketchup or traditionally kachumber. My husband's fishing expedition is going strong with good yields .....don't mistake me for shoals of fish. Seems his future is bright as a fisherman ...... definitely he has started dreaming about shoals of fish..... and I am sure he will one day because he is so passionate about fishing. So boooy....blessings again ....... to reach for big fishes. 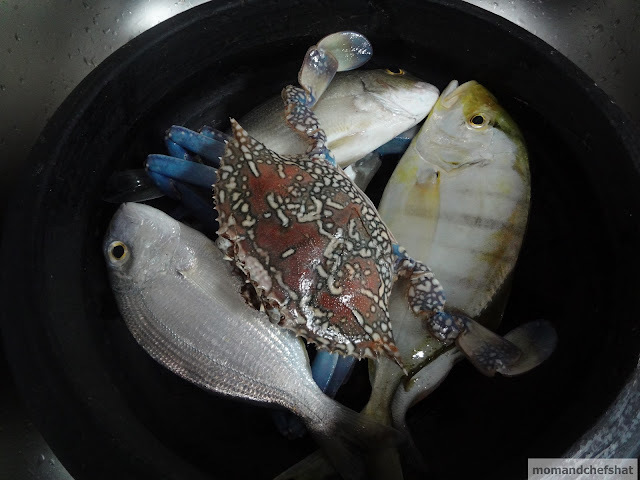 Considering we are not much of fish lovers (fisherman hesitates to eat his own catch), we make it a point to distribute the whole catch among friends. He got some crabs so thought about sipping on some hot cuppa of crab soup, but thoroughly discouraged after an unsuccessful attempt. Again it is a return to Mommie's munchatti for some easy deliciousness. Clean the sardines. If the sardines are big, cut it into 2. In an earthern pot/munchatti, mix all the ingredients from 1-11 with your hands. Pour 1/2 cup of water to this. Place this on stove and let it boil. Then, lower the flame. Pour oil into the meen peera. Close the lid. 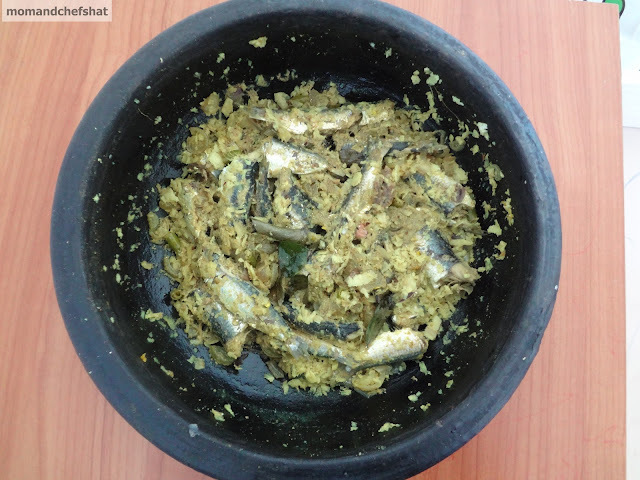 Shake the munchatti to mix the curry thoroughly and don't stir with the spoon (This is to avoid meen peera going mushy). When the water is evaporated, switch off the stove. Serve hot with rice.